Backpacks make it possible for riders to carry items they couldn’t have otherwise carried to the trail for their snow activities. They have grown to become necessities rather than luxuries and with time the lightweights will be taking over the scene. A good thing is that manufacturers are each time coming up with innovations and designs to cater to this growing need. This refers to how much space a backpack has. Of course, this varies greatly and will determine how much one can carry to the field. Getting the right fit will give you the comfort you deserve. The more popular backpacks come with adjustable shoulder straps and waist belts. However, you will still need to try on the backpack and ensure it doesn’t go below your waist before purchase. Apart from the main compartment, extra pockets on the exterior and interior will help you store your items accordingly. Some backpacks are designed with organizers in their main compartment. Also, ensure that pockets are easily and conveniently accessible. Straps help distribute the weight of the backpack. Adjustable straps are more preferable. Other backpacks come with weight straps that pass across the chest to distribute the weight even further. The best snowmobile backpack is made of abrasion-resistant waterproof material mostly Ripstop nylon. Nylon is also lightweight. Another less popular material but lightweight and of better quality is Cuben fiber. Go for strong weather resistant zippers. Padding on pressure points like on the shoulder straps is important as it eases the strain allowing for comfort and support. A reflector is an important safety feature that enhances visibility. Many more factors go into consideration during the purchase of backpacks and while some are common, others are more of personal references. Well, we have discussed the more crucial features however you will still need to go a step ahead in selecting the best according to your needs. Below is a review of some top backpacks that are flying off the shelves for their premium quality. Browse through to see an analysis of the features that make them stand out. 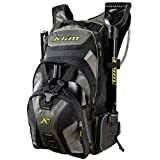 The advanced Nac Backpack by Klim is an all-inclusive storage bag that you’ll need to hit the trails during winter. Whether you intend to go for a short adventure, a night out or week-long sledding, it will accommodate almost all you need. It is classic, it is roomy, it is tough and most importantly, it is versatile. With specific compartments for all you need to carry including; an external slot for your shovel blade and another on the side for its handle, a hydration gathered sleeve and two exit ports on the upper side, a compartment for your accessories, an internal zippered sleeve pocket for the more delicate gadgets, removable goggle bag and tool pouch on the inside, a inch of elastic loop to organize your tools, a side probe storage as well as a zippered stash pocket for the quick access items, there is no going wrong with the Klim Nac Pak Backpack. Secondly, it is comfortable. It features a back panel and shoulder straps with airflow padding to ease the strain on your back and shoulders especially when you have to carry a heavy load or climb steep slopes. Additional accessories include waist straps that are functional during ascents, a sternum strap with a whistle and 3-liters hydration pack from Hydrapak because you are bound to get dehydrated. Finally, it’s an all weather backpack constructed with the waterproof breathable material because your items need protection and ventilation just like your body. By far this is one of the best snowmobile backpacks with a shovel that has proven functional beyond doubt. Klim continues to top reviews with its quality backpacks and the TPU polyurethane Krew Pak is no exception. While is has some of the features in the Nac Pak like the external shovel blade and shovel handle storage, an accessory pocket that’s slightly larger and a side probe storage, it runs a bit large at 21 x 13 x 5 inches capacity and lightweight at only 2 lb. A distinctive feature is that its main compartment is comparatively large and it is designed with a separate back loading hydration compartment with one exit port and a side storage for your avalanche probe. Fleece lining on its top-loading goggle pocket and on the zippered storage located at the shoulder is a noteworthy protection and insulation feature. Other pockets include the secondary storage equipped with a divider and two pockets at its base. For your tools, the tool pouch and the one-inch elastic organizer will come in handy. And because safety is not a matter to be overlooked, this one comes with a reflective strip for visibility. Comfort features include a back panel and shoulder straps padded with Quilted Airflux to maximize airflow and ease the strain on these areas. With the YKK heavy duty zippers, this backpack is completely waterproof and durable. The padded belt with pocket at the waist and the 3-ltr Klim Hydrapak hydration pack is a worthwhile addition. Cleaning and drying is as simple as sliding it open and doing the necessary. 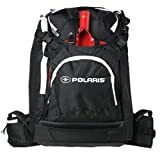 This nylon constructed backpack by Polaris is a fine quality addition to your snowmobile gear. It comes equipped with adjustable shoulder and sternum straps with padding to maximize comfort and ease the strain exerted on the shoulders due to carrying the load. Adjustability also makes it a good fit for varying human heights. 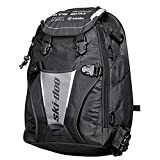 Along with waterproof zippers, this bag makes a good option if you are looking to venture in wet snow conditions carrying items like food that need to be protected from contact with water. The OGIO backpack also features roomy compartments with extra side and front pockets to accommodate a shovel, a probe, and other quick access items. Finally, it comes with an amazing ergonomic design that will let you ride on without feeling the effect of the weight on your back. The Ski Doo tunnel backpack is a true reflection of class thanks to its striking design and versatility. Speaking of versatile, this tunnel bag doubles up as a backpack thanks to the easy-to-operate disconnect system that transforms it from one form to the other. It also features the LinQ Cargo Base Kit model 860200583 useful when mounting it on your sled as a tunnel bag along with a soft strap for securing it firmly. Extra storage features include an external slot specifically for the Ski-Doo Shovel model 860201461 as well as an avalanche probe model 520000408. With a 28-liter capacity and a 137-inch long strap, this bag is just enough for your belongings. It may not be as compartmentalized but it sure will offer you great service. Finally, its buckle closures and zippered pockets are a convenient feature we can’t overlook. 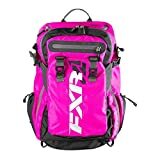 The Fuchsia Backpack by FXR comes with numerous comfort features that make it the best snowmobile backpack for long brutal ventures. With a meshed panel at the backrest for ventilation, your back is sure to have it smooth, dry and comfortable throughout your adventure. This suspension system is detachable. Along with adjusting waist belt, chest and shoulder straps, you are guaranteed a great fit. It also features a spacious main compartment with plenty of extra pockets including shovel storage on the external, a goggle pouch lined with fleece and organizer pockets for other small gadgets that you intend to carry along. Quite uniquely, a rain cover has been incorporated in its design making it a perfect all-season backpack. The SE-3040 backpack designed by Nelson-Rigg is a durable piece that will take ages to completely wear out. It is made of premium durable Tarpaulin PVC, has been UV coated, and features electronic heat welded seams alongside an airtight roll closure to give it 100% waterproof ability. This 40-liter backpack features numerous versatility features including a dual-closure system; over the top and down the sides, a design that easily converts to a waterproof tail pack with a quick-release strap, a removable molle panel that can be reversed with the waterproof document pocket, together with numerous pockets to organize your items neatly inside the backpack. The reflective webbing enhances visibility while the large side mesh pockets will hold your water or fuel bottles. Its inner sleeve is large enough to hold a 15-inch laptop or notebooks and the attached front pocket will come in handy when you need to carry a hydration bladder. The SE-3040 backpack is quite comfortable with a padded back panel designed with an airflow system and padded adjustable straps. It is important to choose a backpack that, first and foremost, is the right size for both your body size and height. Next, consider its comfort and convenience features before you can make your purchase. Remember the wrong choice will cost your trip and muscle health. Again get the right volume depending on how much cargo you intend to carry during your trip. Do you need to organize your items inside the backpack? Well, this will certainly help you have easy access and protect gadgets like mobile phones that can easily get damaged. Nowadays, the best backpacks will come designed with inside partitions and several interior and exterior pockets, some that are dedicated, to help you have all your items and gear in their rightful place. Apart from being organized, this is a good way to take care of your backpack for it to last longer. If you will have to enjoy your activities, let it be with the right snowmobile backpack.